Marvelous Multiagers! : Hi, Spring Break! We went to see The Stinky Cheese Man play this morning! It was so funny and well done. My class loved it! The actors interacted with the audience and even grabbed one of my first graders to go onstage as Goldilocks. This little boy panics when he is under pressure, so I was really worried about him up there but he did so well!! To get us ready for the play, I read some of the stories from the book and then we rewrote classic fairy tales just like the book did. They aren't done yet but suffice it to say that my class has a lot of imagination. Moving on, yesterday I checked my bucket filler pocket and noticed two new slips in there that I hadn't seen before! Both of them made me laugh so I wanted to share them. She does work really hard. True story! Right now this little lady is in India for 3 weeks and I miss her every day! Anyway here is my new license picture! I had to take my glasses off because of the glare and it is so weird seeing myself without them!! Oh wait, one last thing... I just found this book at the library yesterday and I'm already a third done. Did anyone else read the Sisterhood of the Traveling Pants books?? Or see the movies? This is the story of the four girls 10 years later when they are almost 30. I am a Kostos lover personally and he is back in this book!!!! So that's all! Welcome to my life, spring break!!!!!!!!!!!!!!! 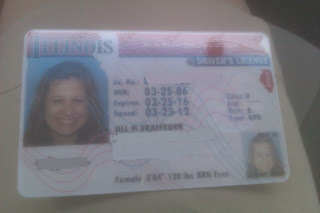 Happy, happy spring break Jill!! I use the word snuck all of the time, I thought for sure it was a real word! I've got the Traveling Pants books. My cousin just bought me the most recent one. Maybe I'll get it read over spring break. Love those bucket fillers! Too cute! I will definitely have to check out that book!